– Practical Network Defense – PND – Network and system security topics. Lessons include full practical setup guides and a virtual lab in Hera for the student to practice their new skills. Get a FREE Trial. – Practical Web Defense – PWD – The most comprehensive hands-on course on Web Application defense against real-world attacks with detailed techniques and methodology to simplify defense of web applications. Get a FREE Trial. – Advanced Reverse Engineering of Software – ARES – Get theoretical and practical skills to perform advanced reverse engineering on software and malware. Includes hands-on challenges. Get a FREE Trial. Head to any of the courses listed above and don’t forget to use coupon code 10D-10P for a 10% discount upon enrollment! Individual features depend on the course-edition. This special offer is valid for enrollments into all Editions of the PND, PWD, ARES and MASPT training courses, including the installment options. 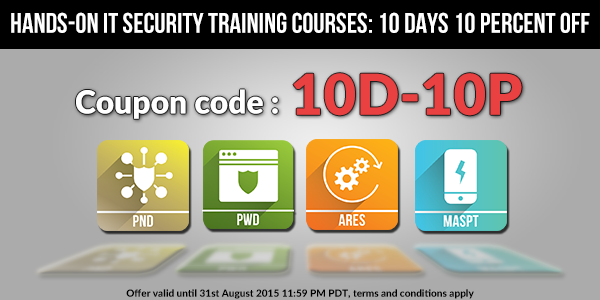 Only valid for enrollments before August 31 2015 11:59pm PDT. Offer can’t be combined with any other offers and only be used once per student. Terms and conditions apply.